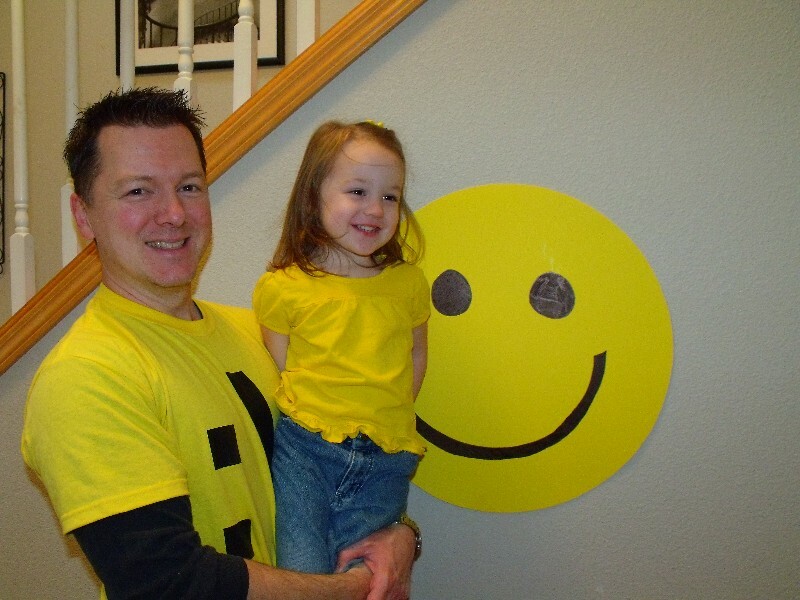 We love to do theme birthday parties around here. I let the girls pick a theme then we just go crazy with it. 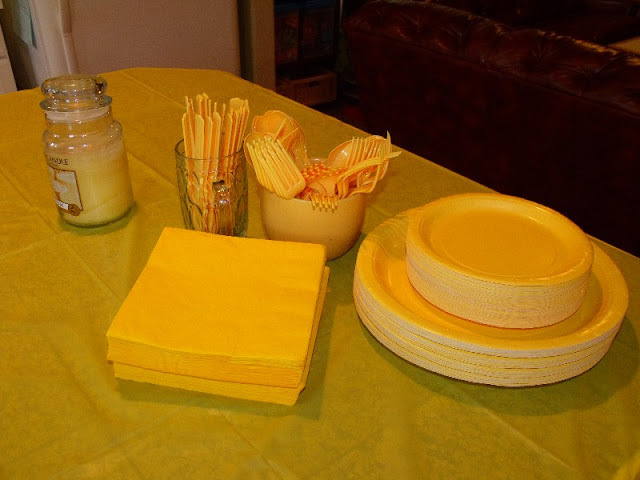 The colors match, the food goes with the theme, even the games are theme related. I have so much fun coming up with ideas that tie everything together. The funny thing is, I have yet to blog about any of them. 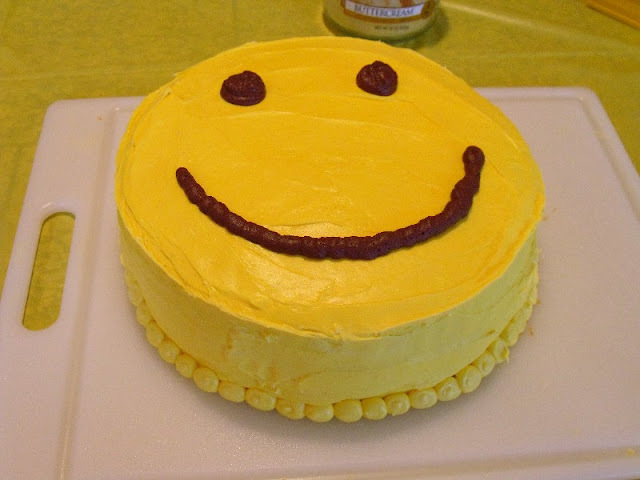 I thought I'd start off with a really cute and inexpensive idea for a young kid's birthday party: The happy face birthday! I love the challenge of picking a theme that is not found on your typical grocery store aisle. The inspiration for this party came from an unusual place, the road trip over to my mom's house. While heading up the hill on the main road, someone took an old satellite dish, painted it yellow with eyes and a smile, stuck it right up at the top of their driveway. 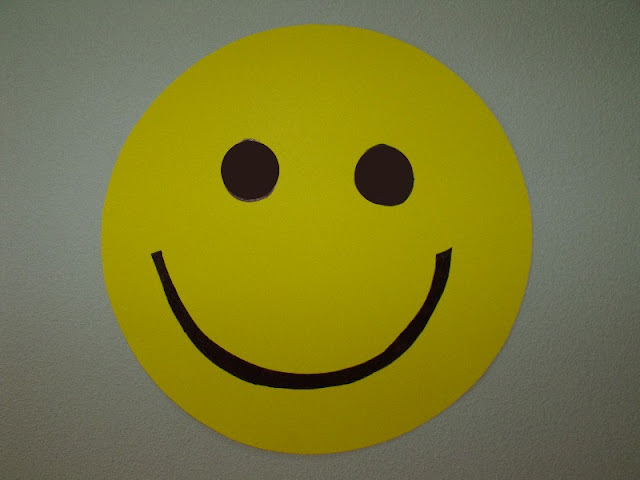 Now everyone that drives by sees a friendly happy face. 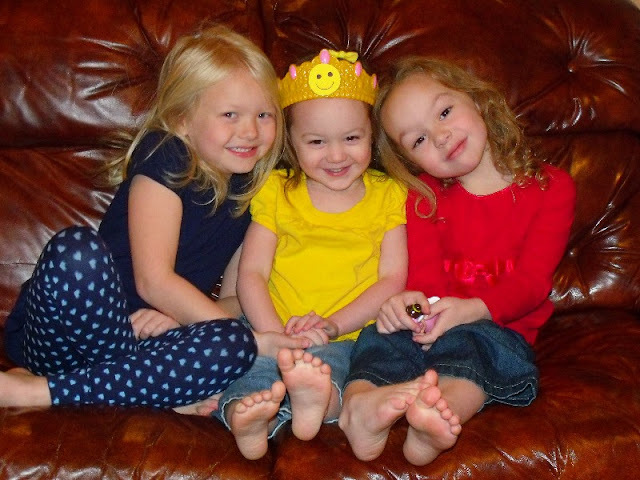 My girls, since they were babies, would ask when was the happy face coming on our trips over there. As we passed they would say "HI HAPPY FACE". They love it. 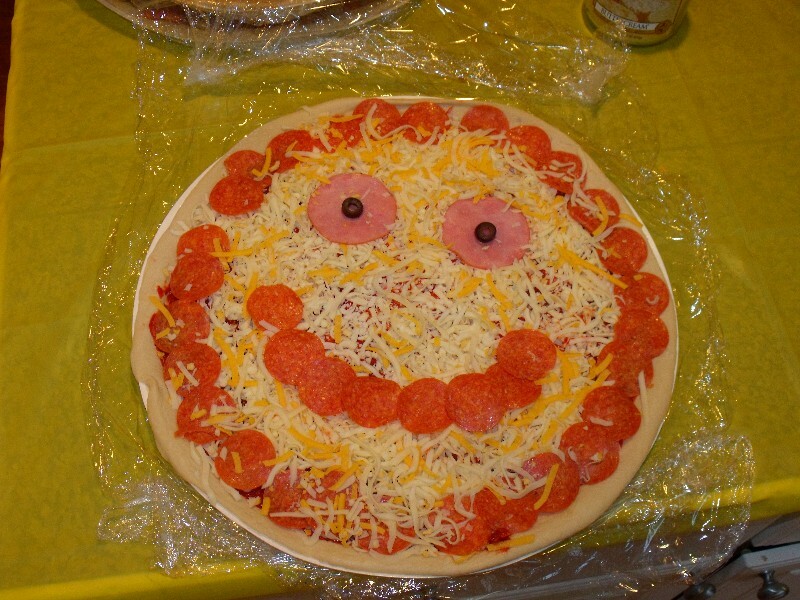 So when my youngest was about to turn three, and I asked her what kind of birthday party she wanted... she immediately said HAPPY FACE. I personally never would have thought of it, but this turned into one of the cutest (and very inexpensive) parties we have thrown to date. 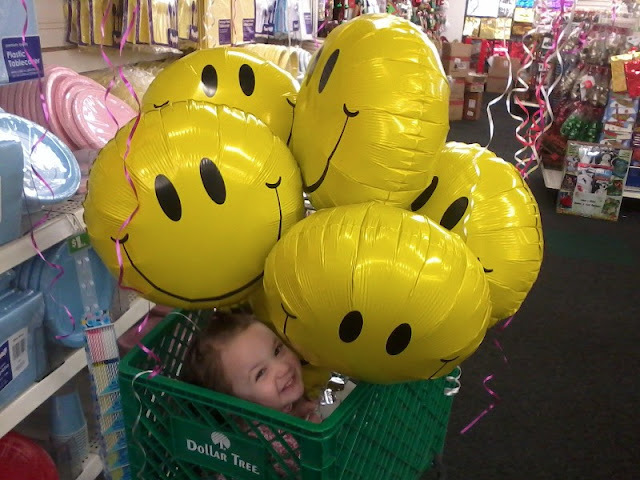 I went to the dollar store for a lot of these supplies. First you can't go wrong with balloons. How many happy faces do you see? We also got a bunch of yellow poster board, traced dinner plate circles on them and cut them out. We also used cereal bowls to trace and make smaller happy faces. Then using a sharpie we made eyes and mouths. These went all over the house (I found that using cheap dollar store duct tape will allow you to tape things like this to the walls and it comes right off after, it does not damage the paint). 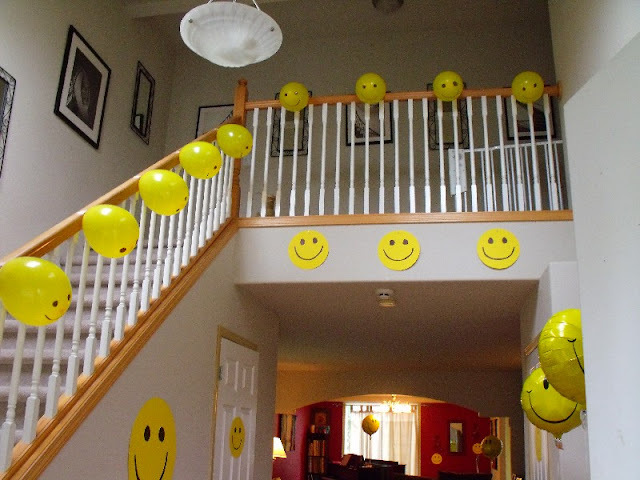 Besides placing poster board happy faces around, we also got regular yellow balloons and drew more happy faces on them with a sharpie. We had some extra fun attaching them up the stairs. 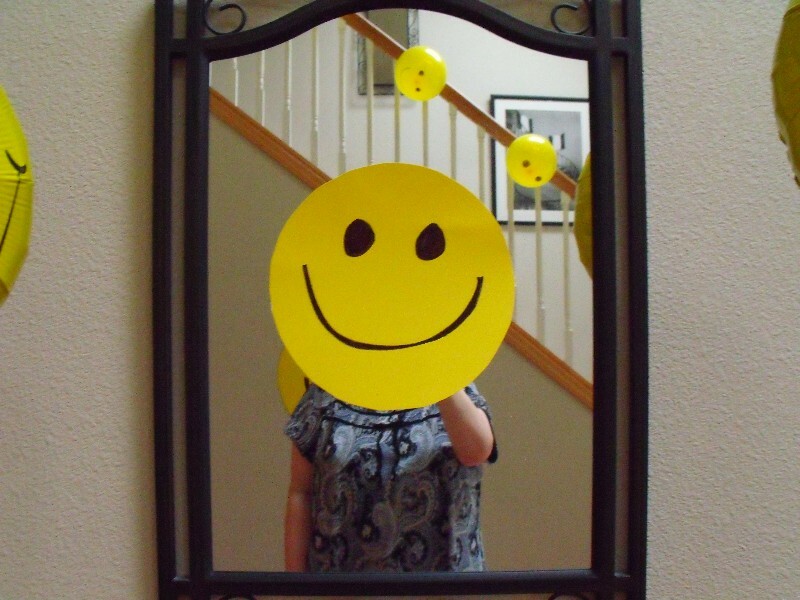 I even put one of the poster board happy faces on the mirror, for a funny effect. 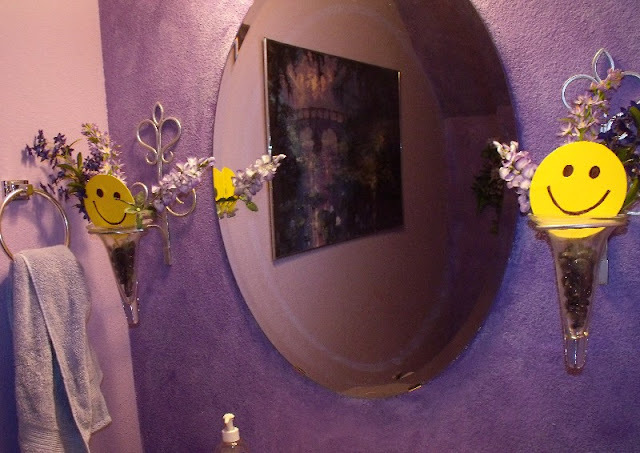 Those happy faces showed up everywhere, the walls, the doors, even the bathroom! For favors we had inexpensive yellow bags up on the mantle with tons of little happy face balls, stickers, pencils, and candy inside. 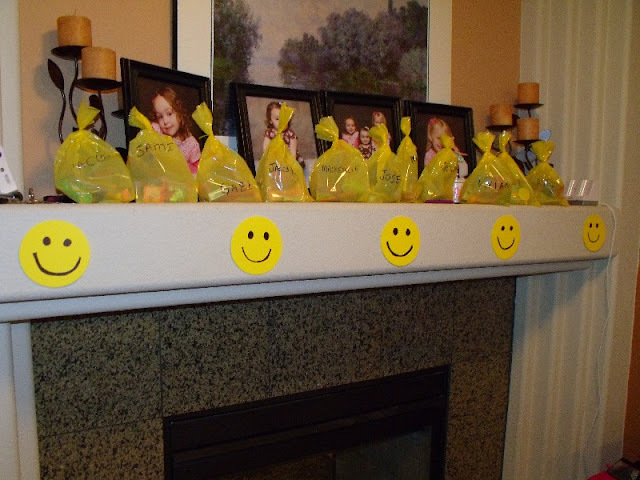 My original idea was to use yellow paper bags and draw faces on them, but ended up not finding what I needed color wise. These worked out great though. 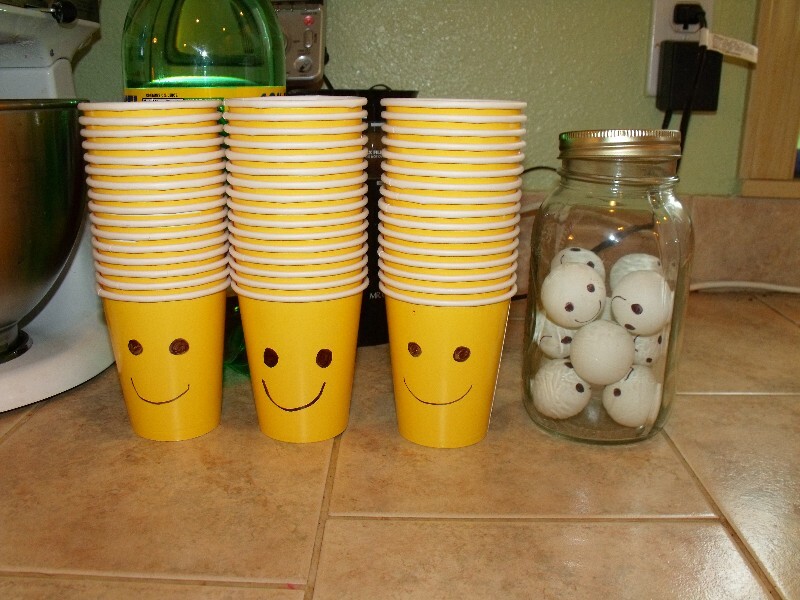 For added fun, I bought yellow cups, and drew on more happy faces. These were a big hit! My oldest had the idea to make a tiny happy face and put it on a crown for her little sister. For the food we got pizza from Papa Murphy's. They were so nice and accommodating when we asked if they could make happy faces on the pizzas as well. 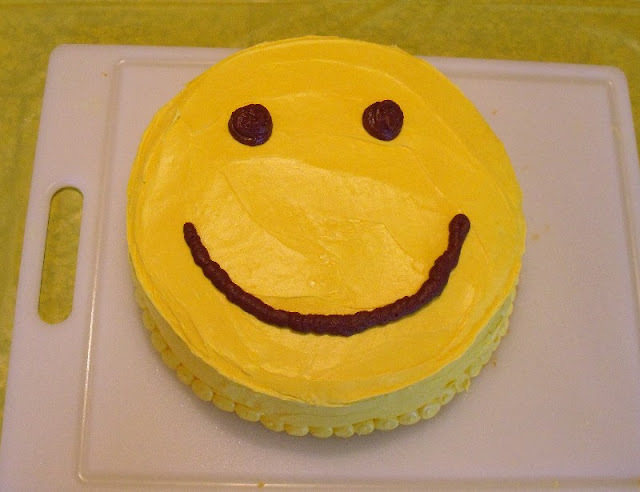 I made a double layered 9-in round cake, and of course made it a happy face. 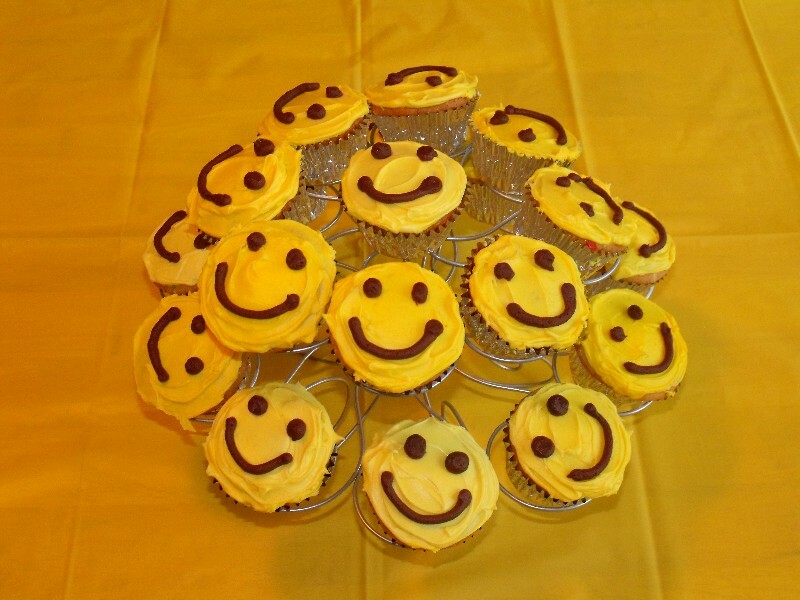 And since we have a big family, I also ended up making cupcake faces as well. For games I tried to keep it simple, since the birthday girl was only three. 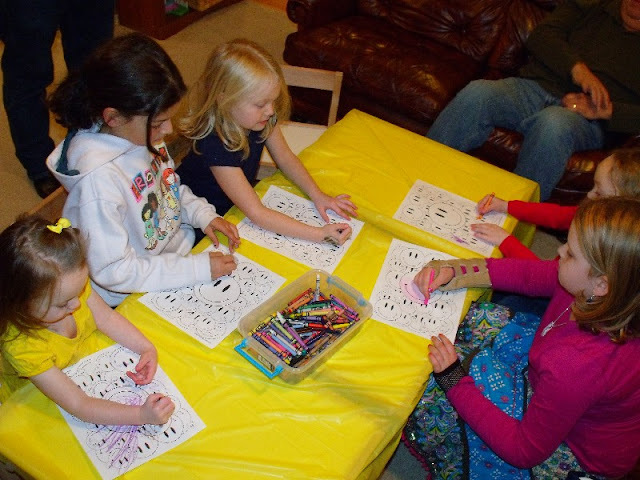 We started off with happy face coloring pages, which even the bigger kids loved. 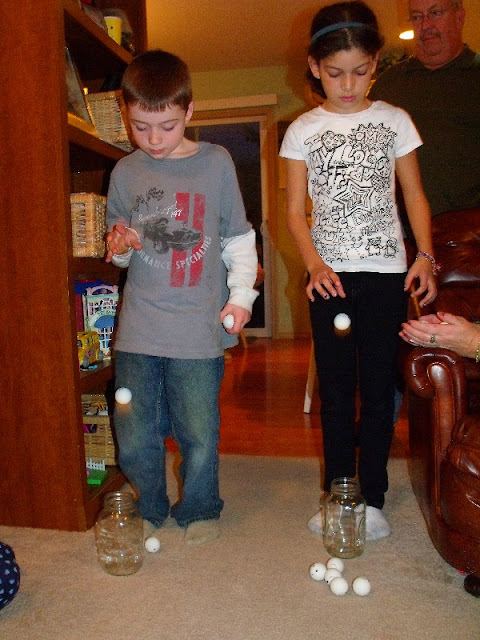 Each player would see how many they could drop in 30 seconds. 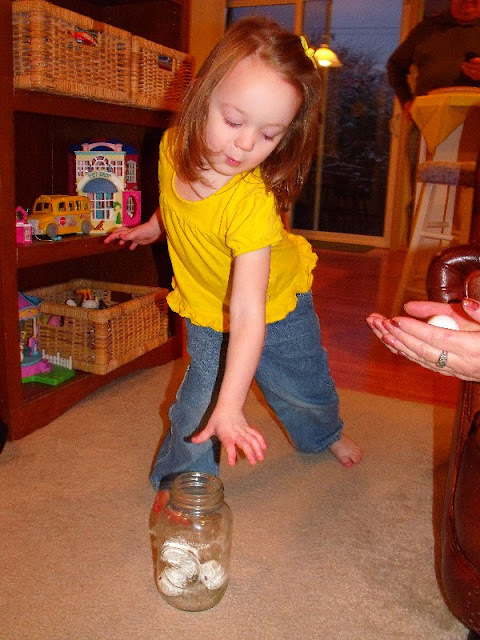 Then we had a "Drop off" for the two with the highest amount to choose the final winner. The competition got surprisingly heated!! 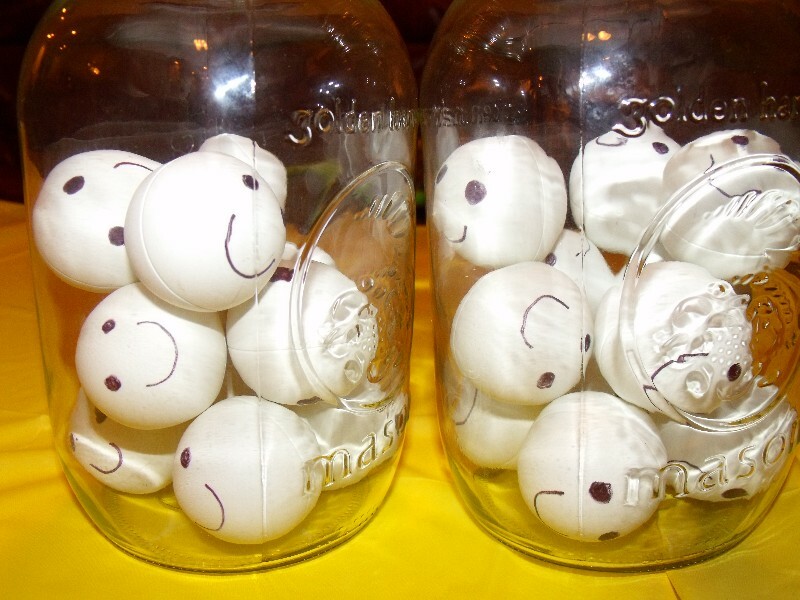 Cute little ping pong happy faces after the game was over. 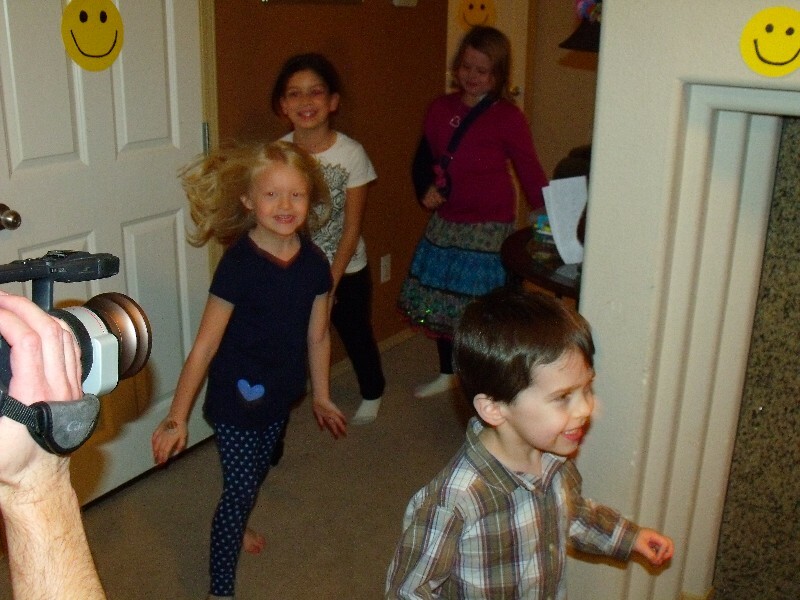 Game #3: Dance in a line and make happy faces to the camera to the song "Don't Worry, Be Happy"
Cake time. 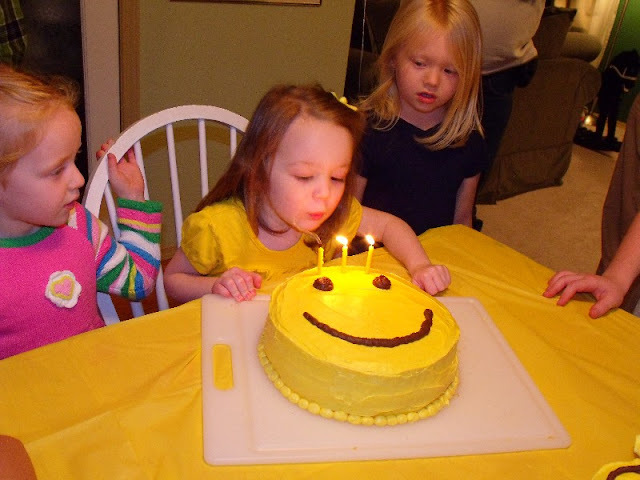 Here is my little one blowing out her candles. All in all it was a great little themed party. Everyone seemed to enjoy themselves and there were plenty of smiles to go around (pun intended). We've done tons of parties since then. I can't wait to share them all with you! Thanks so much and have a "happy" day!! She is such a cutie pie! I have to say she is beautiful. Happy birthday to the little one. It is a good theme for the party and the place looks like some event venue decorated amazingly well. It seems like everybody had a good time here and I also got some ideas for my niece’s birthday.